Should clients avoid this popular food additive to protect gastrointestinal health? Carrageenan may be the most controversial food additive that many people have never heard of. Although it has been used for decades as a thickening agent in a wide variety of foods, a growing body of evidence is raising questions about its safety. Those who seek its removal from the food supply point to studies that have linked carrageenan to digestive diseases, inflammation, and even cancer. To date, the FDA has rejected calls to ban the additive, citing several studies that have not linked carrageenan to harmful health effects. This lack of agreement may leave nutrition professionals wondering how best to counsel clients. A recent report by the Cornucopia Institute, a corporate and governmental watchdog group, makes a case for banning carrageenan. The March report cited several studies that have used animal models as well as human cell cultures to demonstrate carrageenan’s harmful effects. The report stated that experts have known about these adverse effects for decades. “Starting in the late 1960s, research linked the type of carrageenan used in food to gastrointestinal disease in laboratory animals, including ulcerative colitis-like disease, intestinal lesions, and colon cancer,” according to the report. Part of the controversy stems from the fact that carrageenan has been used in food for a long time; it was grandfathered in as a safe additive in the 1970s, avoiding a lengthy regulatory process. The FDA doesn’t believe the available evidence makes a strong enough case to ban it, noting that none of the studies have been done on human subjects, and they did not replicate the conditions that exist in the human digestive system. Carrageenan can be found in many types of products, including cheese, ice cream, bread, jelly, jam, and some processed lunchmeats. It’s often used as a stabilizer in beverages whose contents are known to separate, such as chocolate milk and nutritional supplements. It also may be found in products made with a carrageenan-containing ingredient, such as pies that use condensed milk, although it may not be listed on the product’s ingredient list. It doesn’t contribute any nutritional value or improve taste, safety, or shelf life. Carrageenan is derived from red seaweed, and alkali or acids are used to separate it from its source. When acid is used, it causes the carrageenan to degrade to a lower molecular weight than carrageenan processed with alkali. Higher-molecular-weight carrageenan often is referred to as “food grade,” while low-molecular-weight carrageenan is referred to as “degraded.” This difference presents a significant challenge in assessing the additive’s safety. In June 2008, Joanne K. Tobacman, MD, an associate professor in the department of medicine at the University of Illinois at Chicago, filed a citizen petition with the FDA to ban carrageenan. In her petition, Tobacman cited several studies she coauthored that found harmful effects associated with the additive. The studies used amounts of food-grade carrageenan that are lower than those ingested in the typical American diet. In each study, the food-grade carrageenan caused inflammation. Tobacman says carrageenan, whether food grade or degraded, predictably causes inflammation because of its chemical structure and says thousands of studies over several decades have demonstrated this effect. She adds that the acidic conditions in the human digestive system likely will cause food-grade carrageenan to degrade in the body. But the broader question is whether it’s possible to effectively separate high- and low-molecular-weight carrageenan. FDA regulations don’t include a specification that addresses low-molecular-weight carrageenan, but the European Union has proposed a threshold of no more than 5% of the total volume of carrageenan. While the question of how to separate degraded from food-grade carrageenan may not be clear or whether it’s even possible, a larger point of contention is how food-grade carrageenan affects the human body. Although the harmful effects of degraded carrageenan have been well documented, as mentioned, studies of food-grade carrageenan have focused on only animal and cell culture models. The FDA doesn’t consider these models to be analogous to the way people come in contact with carrageenan. Because of carrageenan’s inflammatory properties and potential to cause other harmful effects, along with the fact that Tobacman is convinced degraded carrageenan can’t be effectively isolated from food-grade carrageenan, she believes it would be unethical to perform studies on humans. For these reasons, she advocates banning the additive. She also notes that carrageenan consumption varies widely, and some people may be consuming significantly higher amounts than what’s considered average: 250 mg/day, up from 100 mg in the 1970s. 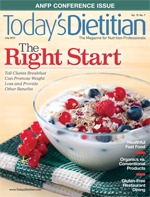 Tobacman’s advice to dietitians is to consider carrageenan as a possible source of digestive illness in their clients. Not everyone, however, agrees with Tobacman. Joy Dubost, PhD, RD, CSSD, a food scientist and spokesperson for the Academy of Nutrition and Dietetics, believes the FDA is correct in taking a slow and steady approach, and she sees no reason to sound the alarm about carrageenan. She believes researchers will continue to study the effects of carrageenan but says she has no plans to alter her advice to clients based on the current scientific literature. Lona Sandon, MEd, RD, LD, an assistant professor in the department of clinical nutrition at the University of Texas Southwestern Medical Center at Dallas, says there are several difficulties in applying existing research to a typical diet. One is that there are no studies showing what happens, for example, when someone eats salad dressing containing carrageenan. The presence of other foods and ingredients may change the way carrageenan reacts with intestinal cells. Furthermore, no studies exist that quantify a toxic dose in the context of a human diet and, as Sandon notes, “the dose makes the poison.” Typically, carrageenan is low on the list of ingredients in foods, indicating that it’s present in small amounts. Like Dubost, Sandon isn’t changing the way she counsels clients at this time, but she does believe the existing research raises important questions and more studies must be done.